So I woke up Sunday morning wanting a ravenously rich, unhealthy and big sweet breakfast – fluffy pancakes with maple syrup, crêpes filled with luscious fruits and spreads etc etc – that kind; a big elaborate spread. For a person who skips breakfast most of the days, this is unusual; or may be the want was to fulfill the prolonged deprivation. We contemplated going to iHop, but none of us did gather up the excitement to rush out. A big craving and a bunch of lazy bones made us settle for the crêpes. 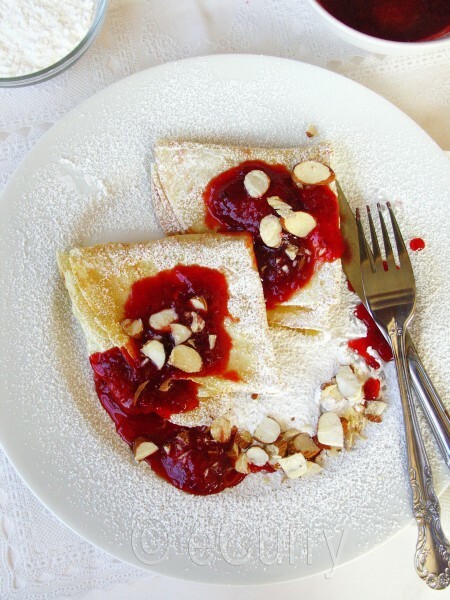 It is the very basic crêpes with added almond flavored. 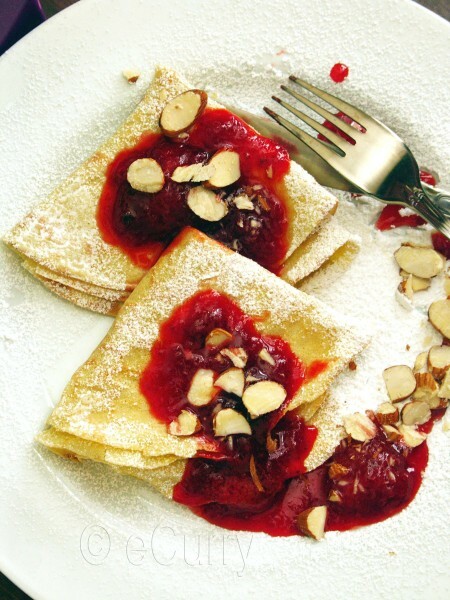 I had frozen strawberries and some fresh oranges with which I made some compote to top the crêpes. Given some other time, I would have gone a bit fancy, taken care to fill them carefully with the compote and pose them pretty, but a hungry stomach and the rituals of photos did not allow such decor. Crêpes are outrageously easy to make with infinite potentials. 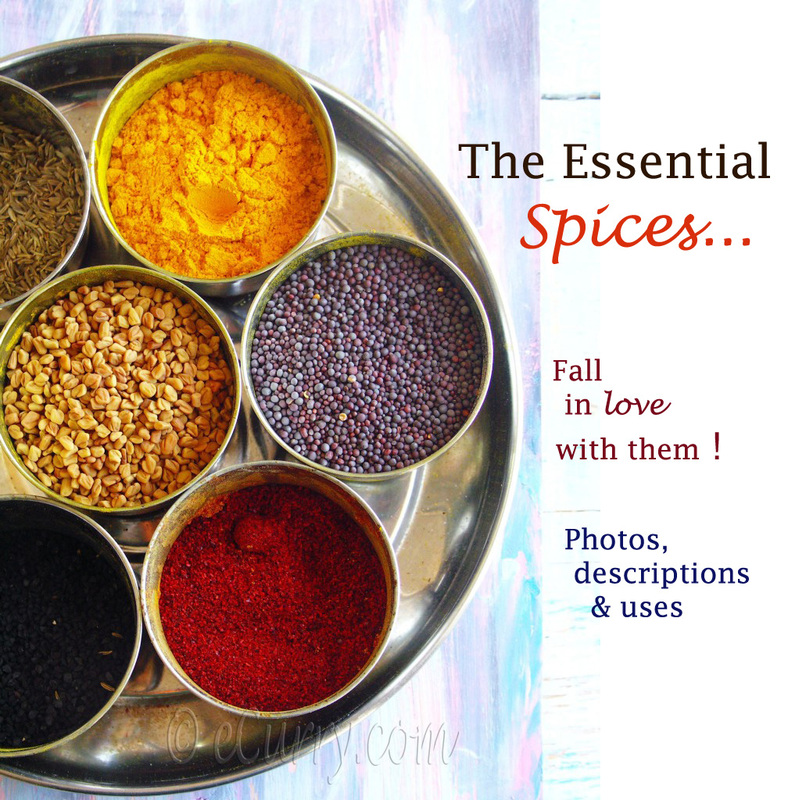 Eat them with fresh fruit or cream, nutella, sauces, jams, compotes or go savory with any variation you want. 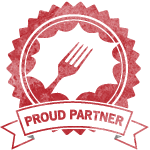 They serve as breakfast, meals, dessert or anything in between. Love them yet? Combine all ingredients for the compote and simmer at medium heat till the mix gets thick and syrupy, for about 20 minutes. Take it off the heat and bring it to room temperature or just warm before serving with the crêpes. This compote will store in the refrigerator for about a week. Use it as a dessert just by itself, topped with cream, ice cream or custard. 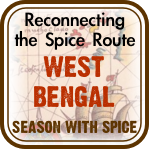 In a bowl, whisk the flour with the salt. Add the milk, egg, sugar, almond extract and 1/2 tablespoon of oil and whisk well until smooth. Cover and let it rest for 20-30 minutes. Heat an 8-inch skillet and rub it with an oiled paper towel. Add about 2.5 – 3 tablespoons of the crêpe batter, swirling the pan to coat thinly & evenly; pour off any excess. Cook the crêpe over moderate heat until the bottom is brown in spots and the sides are crisp and start to curl, about a couple of minutes. Flip the crêpe over and cook for 1 minute longer. Place the folded crêpes on each plate. Top or stuff the crêpes with fruit compote. 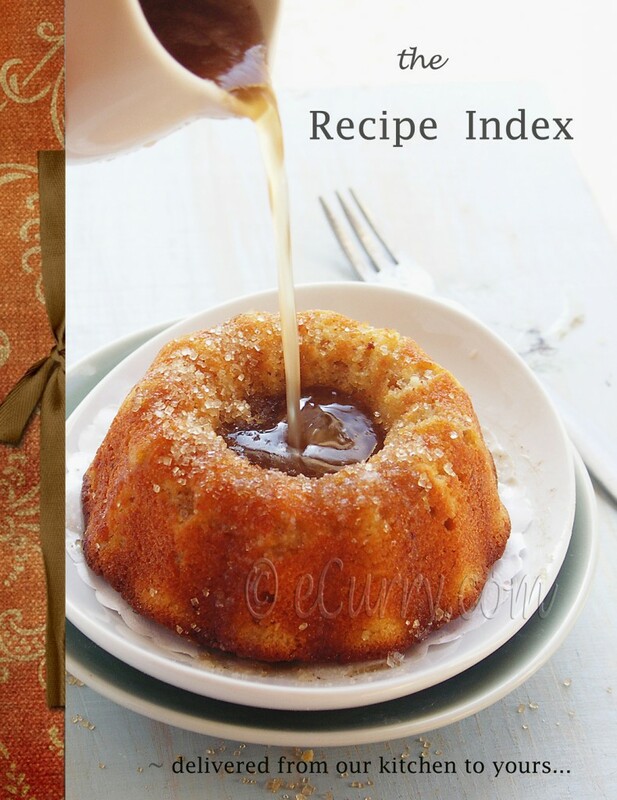 Dust with confectioners’ sugar and serve immediately. Don’t they look sinfully good? The light airy feel of the crepes almost makes me think of butterfly wings. So pretty! Enjoying the crepes was also a memory stirring experience. Crepes always remind me of ma making another version of this called patishapta (crepes made with eggless batter and filled often with jaggery, coconut, khoya – thickened milk or both). Patishapta is very popular in Bengal – the eastern region of India. I’ll post that recipe sometimes later. Sending the Crepes to the Jennifer’s (of Domestic Goddess) Sugar High Friday #61, hosted at A Merrier World. The theme for the SHF is Sweet Comfort. A delightful flavor combo! I love crêpes! sensational looking crepes! love them! i like the flavor combination here! I think my family shouldn’t even know this is online…WOW!! What a gorgeous way to start a day!! Absolutely mouthwatering, drool worthy pictures!! Looks amazing and so vibrant Soma. DD has been asking me to make homemade pancakes (meaning make the batter mix at home). This might be even better. I am rushing off to get breakfast. Haven’t made those in a long time…..as hubby dear is not a big fan of this kind of breakfast…but your plate is making me hungry…may be I should make it for myself in the weekday…. Very lovely.. Happy Pongal ! Omg they look delicious,breakfasts like this and who wants to sleep in..yummy and beautiful clicks. And the almonds are the perfect topping. Thanks for sharing! What a lovely breakfast! They look gorgeous. I love the strawberries and orange! 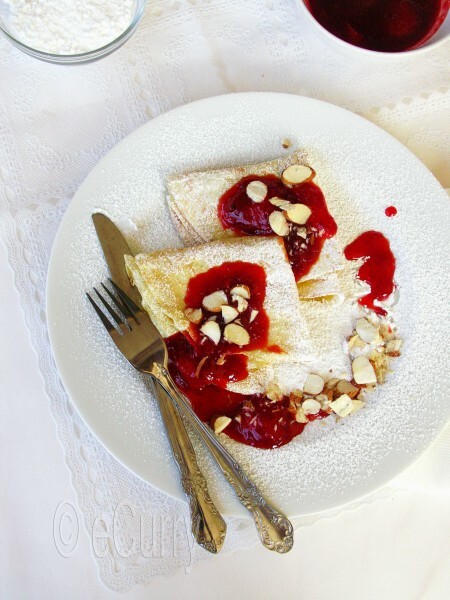 I adore crepes – they sound excellent with strawberries and orange compote! So beautiful and delicious looking. I can’t believe you didn’t invite me over for breakfast! thats some delectable dessert Soma. when i have sudden sweet cravings I often make these. easy yet satisfying! It’s beautiful like snow! love crepes! So beautiful, fresh, and delicious! What gorgeous breakfast and lovely way to tame a sweet craving. Happy New Year! I missed so many of your posts…am back on track !! This is a gorgeous recipie !! They look sinfully delicious, Soma. Love the pictures, the color contrast, sprinkling of sugar, they look so professional. Loved the combination strawberries and orange for Compote; both are my favorites. I am finding it difficult to find good strawberries in the market now. Cannot wait for spring. Hope you are all doing good. Makes a wonderful breakfast or dessert girl, looks delicious. Yeah. gardening is a pleasure. I didn’t grow anything at first when we came here but once the veggie patch was up, I enjoy gardening immensely. Oh,these look amazing! I’ve never heard of anything like this.Thanks for sharing.. 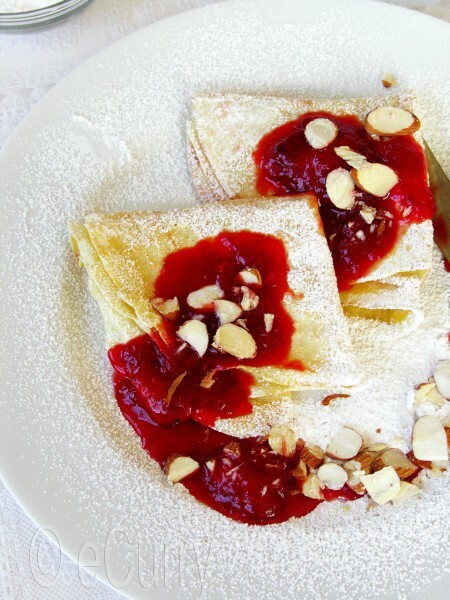 Your crepes look lovely, and the compote sounds delicious! The almond slices on top look great as well. I’m going to have to make crepes soon! Crêpes at any time of the day really ! I like them sweet and savory too. They look delicious ! Wow! Looks so delicious. 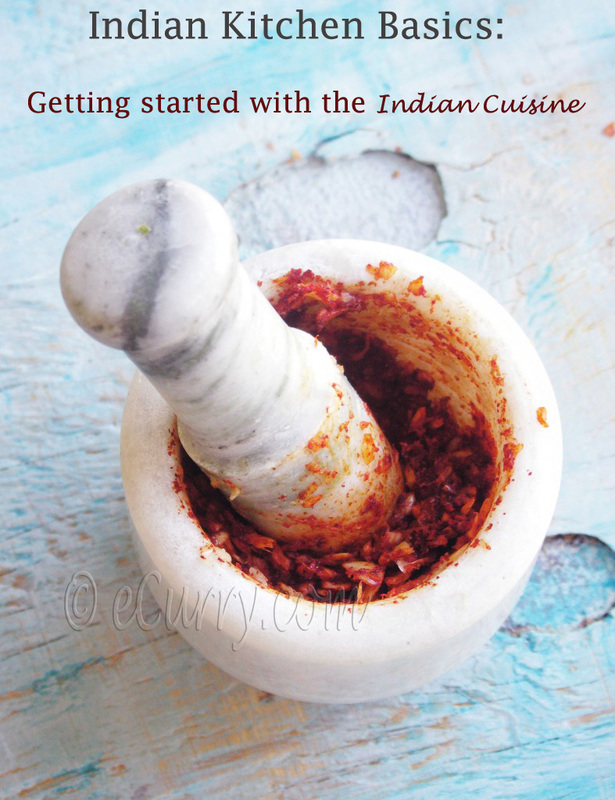 I hope I will make once using this recipe soon.